This is one of the most spectacular travel posters, in my opinion. It’s rich and unique colors help it stand out from the rest. 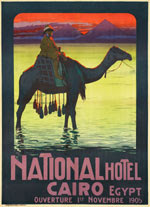 It was created for the newly opened National Hotel in Cairo in 1905. Designed by Mario Borgoni, it features an explorer mounted on a camel surrounded by a stunning sunset over the pyramids.